DSM Console Server products help to minimize network downtime by providing IT personnel with secure, reliable Out-of-Band Rescue™ access to console port functions on remote network devices. Access Critical Network Devices with Out of Band Management... Even When the Network is Down! Networks often crash because of very simple problems; problems that could easily be fixed ... if you could just get your hands on them. An out of band management solution often provides exactly what network administrators need in order to get their hands on problems at remote network sites. With a console server out of band management solution, you can easily connect to console ports on remote network devices, and invoke troubleshooting and configuration commands to quickly deal with malfunctioning network equipment ... without a long drive to a remote equipment site. An out of band management solution cuts network administration costs by eliminating expensive service calls to remote sites, and also minimizes network downtime, by providing a fast, secure way to get your hands on network problems without even leaving your office! WTI offers a wide range of Out-of-Band Management products to fit the needs of most remote console management applications. In addition to our line of dedicated Console Server products, we also offer Console Access Server + Power Control Hybrid products, which provide both remote console port access and remote control of power switching and reboot functions. An out of band management solution provides network administrators with an alternate means to access remote network devices when the primary network is down or unavailable. 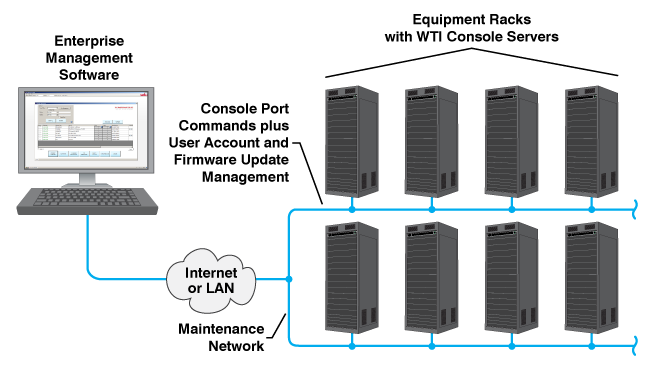 Typically, an out of band management solution consists of a terminal server or console server which resides on a secondary maintenance network, yet is able to contact network devices on the primary network via cable connection to serial console ports on the network devices. 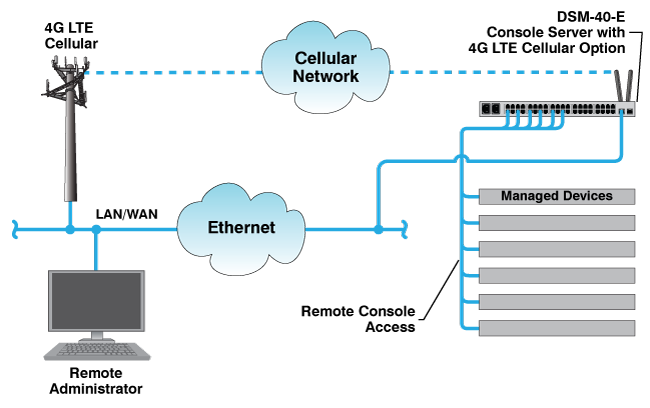 In cases where a secondary network is not feasible, a 4G LTE Cellular or dial-up connection can also be used to connect to the console server in order to provide out of band access to command functions on remote devices when normal network communication is not available. Out of band Management is a vital tool for network administrators who need access to command functions on remote network devices. But in order for an out of band management application to be practical, it's important that access to critical command functions remains secure. That's why WTI out of band management products include a formidable array of security and authentication features to ensure that only authorized users gain access to important command functions. WTI out of band management products include a multi-level user's directory, IP address filtering, dial-back security for modem communication, and LDAP, TACACS+, Kerberos and RADIUS authentication. In addition, WTI out of band management products also include an invalid access alarm, which can automatically lock port access and notify administrators when excessive invalid access attempts are detected. The Direct Connect feature enables users to create a Telnet, SSH or Raw Socket session with the WTI Out of Band Management unit via Ethernet, 4G LTE Cellular or dial-up, and establish a quick connection to a specific serial port without the need to first access the command interface. The Direct Connect feature assigns a unique TCP port number to each serial port on the Out of Band Management unit, allowing users to connect to ports by merely specifying the desired TCP port number in the connect command line. The Direct Connect feature can be individually enabled or disabled at each serial port on the Out of Band Management unit. In cases where a secondary network is not a workable solution, many remote network facilities rely on dial-up access to out of band management capabilities when their primary network is down. The Callback Security function effectively creates an additional security check to ensure that only authorized callers are able to access critical out of band management command functions. When Callback Security is enabled, callers are not allowed immediate access to command mode merely by entering a valid password. Instead of allowing an immediate connection, the out of band management unit will disconnect, and then dial the caller back at a pre-defined modem number before allowing access. If desired, dial-up users may also be prompted to re-enter their password after the out of band management unit calls back. One of the most common challenges for an out of band management application is that it isn’t always easy to keep track of environmental conditions and events at remote network installation sites. Although out of band management applications work great for providing remote access to command functions on faraway network elements, not all out of band management solutions include a means to monitor conditions at remote sites. WTI out of band management products meet this challenge head-on by providing a formidable assortment of event alarms and environmental alarms, specifically designed to help administrators to keep tabs on conditions at remote equipment sites. WTI out of band management products can monitor rack temperatures, communication conditions, ping response, power events and port buffer status, and then immediately notify you via SNMP trap, email, text message and/or Syslog when user-defined critical conditions are detected. An intelligently planned out of band management solution can allow network administrators to deal with problems at remote network equipment sites without even leaving the office. Out of band management eliminates the need to physically travel to remote equipment sites whenever an important network element hangs, crashes or needs reconfiguration. When a WTI out of band management unit is installed at a remote site, administrators can simply log in to the unit via secondary network, 4G LTE Cellular, satellite modem or dial-up modem and immediately gain access to console port command functions on remote devices. WTI out of band management units are available with up to 40 serial ports for connection to console ports on network elements at remote sites, providing a comprehensive solution for dealing with remote network problems without the cost and inconvenience of a service call. WTI Out of Band Management products eliminate the task of replacing old DB9 cables with new RJ45 cables in order to implement a remote network management solution. Our Out of Band Management products are available in both RJ45 serial port format and DB9 serial port format; allowing easy installation in existing network installations that use the older DB9 format cable or providing a perfect fit for network sites that use newer, RJ45 cables. This allows network administrators to add an out of band management solution to DB9 based network applications without the need to run new RJ45 cables. When location or application make AC power an impractical option, the WTI Out of Band Management unit provides an ideal solution for remote access to important network elements. All WTI Out of Band Management units are available in either 100 to 240V AC versions or -48V DC versions. WTI Out of Band Management products provide an ideal tool for network administrators who need secure, reliable out of band access to remote network elements; even when for remote equipment sites, where DC power is the only available option. In order to prepare for the upcoming switchover to IPv6 protocol, all WTI Out of Band Management Units now provide full support for both IPv4 and IPv6 (the intended successor to IPv4.) This helps to ensure that WTI Out of Band Management Units purchased today will be fully compatible with the planned IPv6 internet environment, and will not be rendered obsolete when the IPv6 protocol eventually becomes the new worldwide standard for network communications. In order to simplify the task of managing multiple console servers spread throughout a large network infrastructure, all WTI console server products include WTI’s innovative Enterprise Management Software. The Enterprise Management Software provides a centralized command interface that can be used to manage, label and control multiple WTI console servers in large network applications, drastically cutting the time required to locate specific units in order to access console port command functions on connected devices. The Enterprise Management Software can search a user-defined IP Address range and discover and recognize all WTI console servers within the range. Once units have been discovered, they are added to the Enterprise Management Software’s inventory list and a descriptive tag can be assigned to each unit to denote the location or function of the device. In addition to providing a centralized interface for remote console port access, the Enterprise Management Software can also be used to control firmware updates for compatible WTI products and edit and manage user accounts at individual or multiple WTI console servers.